Tomorrow night nearly 100 of us are meeting in Redbridge to the north east of London for TeachMeet08 NE London, organised on the fly, on the back of a trip I'm making to the borough that morning. It's not too late to sign up and come and listen to some of the 26 proposed micro- and nano-presentations from teachers, ICT Coordinators and inventors. Better still, though, is to get a chance to see what those in the council I'm working with are already doing. Many will have been hard at the chalkface as the ICT event carried its course during the day, and this is our chance to have a two-way chat about where things are and where they could be headed. It's rare to get that as a speaker, and will make the day so much more enrichening for both me and the Redbridge teachers. It'll also be a great chance to have a chilled chat with Anthony Evans, the Primary ICT consultant that has been behind much (no, sorry, all) of the organising of this TeachMeet. TeachMeet and I were in Tuesday's Guardian, which I managed to miss until I spotted this post on the Ode blog. Indeed, Emap and I have started planning TeachMeet09 (or unplanning it?) 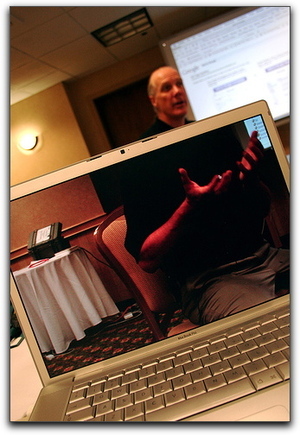 so that we entice more newbies and more teaching teachers to share their seven minutes of cool stuff at BETT in 2009. It'll also help secure more sponsorship from a wider range of companies, and get it closer to the micro-sponsorship I've been trying to secure for the past two years, instead of large one-offs from companies (much appreciated, but rather unfair expectations from us of them, I feel). Don't worry about the wording in the article. TeachMeet is not the property of Emap, it's the property of the people who make it happen - you. 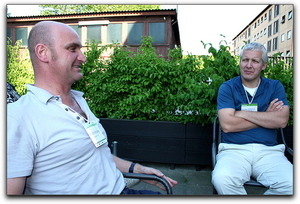 Thing is, they came to the table knowing just this and are excited by their changing role in this unconference-y world. What's more, they provide great support for the event which, I hope, will inform more of the actual BETT conference itself. BBC Scotland is in the process of relaunching its Learning portal and I'm honoured to be part of it, with the first article in a new regular column on what's happening or will maybe happen in learning this year. No space for comments on the BBC article (yet) but feel free to leave your views here. Until Saturday night you'll find me over at Connected Live, blogging, podcasting and vodcasting from BETT, at London Olympia, trying to capture some of the innovations and excitement along with 30,000 other people. the whole thing on a Second Life island. I also owe a huge thanks to Martin Jack at Think Different Events for helping me sew all this together. Come over to the Connected Live blog to follow all the fun! 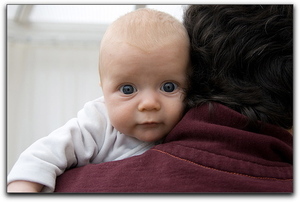 The most beautiful baby on the planet, my number one choice for a photo (though not taken by me). Amongst the memorable times, her first aeroplane trip to New Zealand - 26,000 miles at six weeks. The stats say you love this one: the kilos of kit required to keep online conferences on the road (and this RSS/Flickr/unconference junkie in one piece). I've since upped my insurance cover... 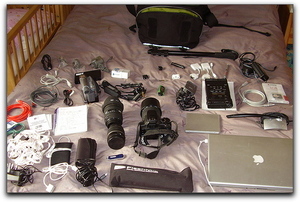 This particular bunch of kit was for something else I loved, but didn't have enough photos for: TeachMeet. January 7th and March 3rd: The inaugural BarCampScotland, which I helped create, was announced and ended up being a resounding success, with 150-odd attendees from across the tech and education industry meeting on common social media ground. December 15th, and the second BarCampScotland is announced for February 2nd 2008. January 19th, and Edinburgh Coffee Morning began, every Friday from that point at 8am in Centotre. Since then, these coffee morning boys (and the occasional woman) have become great friends and allies as we try to get more social media projects undertaken in Scotland. It continues to be a source of inspiration, finds, community-building and trading of work. On February 4th we talked about Glow, life, love, blogging and education in a Stormhoek-fuelled haze as Hugh MacLeod paid some Scottish edubloggers a visit in their local. On April 30th I announced the third edition of TeachMeet to be taking place in Edinburgh on May 23rd: we had a great time and learned loads. By June 23rd we were ready for some more learning and drinky-poos, hence the inaugural Beer 2.0. Such as success it was, we did Beer 2.0.1 the following week. August 9th marked the first steps towards TeachMeet07, the fourth edition to be held at Glasgow's Science Centre on September 19th, and gnerously sponsored for the first time, by Channel 4, whose In The Wild event brought the discussion of young people's media habits to a wider audience still. 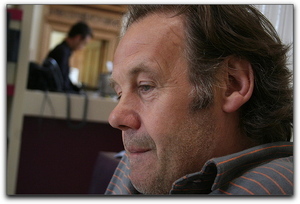 Almost simultaneously, we had calls and requests for England and Wales' first TeachMeet, at BETT on January 11th 2008. There are a few press articles coming out during the week at BETT which will mention TeachMeet08 so, if you want to make sure that you get a spot before the numbers are capped, please leave your name on the TeachMeet website and register for BETT as soon as possible. Please also spread the word about what is an amazing professional development event, one of the best out there in the world. It's not just about technology, it's about the teaching behind it. If you know teachers in the south-east in particular, or if you know an international visitor to the BETT Show, then get them to come along on January 11th for that 'alternative' Friday night out. Finally, even if you've already signed up to TeachMeet08 on the wiki webpage, you also need to register for BETT, in order to gain entry to Olympia on the Friday afternoon/early evening. As ever, we're really grateful to sponsors for helping with the event. So far, though, we have the generous support of Emap, who are donating the venue, their staff's time in setting up and cleaning down, and, importantly the wifi. We also have had an offer of support from TxtTools, whose mobile phone text service will be used to allow the masses to communicate with the speakers all night long - good for those who haven't quite converted to Twitter yet. If you would like to sponsor the event, no matter how little the amount, then please contact Emap, via me or your BETT Emap contact, who will handle your request. TeachMeet08 - Mark it in your diaries now! BETT is the largest education conference in the UK and, for the first time, there will be TeachMeet08 in London, on Friday 11th January, from 5pm-9pm at Olympia, and you're invited. Just head over to the page and sign up right now before numbers are capped. We've got room for a potential 300 TeachMeeters at what is now widely acclaimed as the best professional development for teachers since, well, sliced bread, but, depending on what sponsorship we receive this number might have to be capped. It's going to be a Friday night, so we'll make sure that people enjoy it as much as an Eastenders cliffhanger. But this is as open an event as they come. Thanks to support from these guys we're going to be able to put on some nice treats for those who want to be amused, enthused and learn something new, by teachers, for teachers. Teachers are invited to sign up an idea for a micro-presentation lasting 7 minutes, a nano-presentation lasting 2 minutes or just to lurk. It might even be of interest to those working in the education media interest to see what innovation is actually going on in schools across the country. All you need to do is head over to the page at www.teachmeet.org.uk, and sign up your name. It's not a tech event, either, with the emphasis very much on the Teach. BETT provides a great opportunity to get some new faces interested in new and innovative teaching and learning. Get your friends and colleagues who are at BETT anyway to come along from 5pm and join in the fun. I have tons more to share about the event, some time next week, If you're interested in adding your support to the event before the big sponsors' announcement at the end of November, then send your kind offers to me or through the wiki. What I wonder is: do people want to communicate with us? 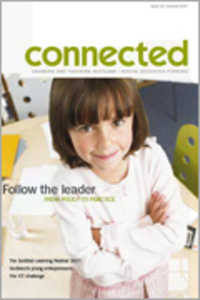 Connected Live, the online version of our award-winning Connected magazine, is part of this, and how many comments we get on articles in one indication of how people feel about Scottish education today and how they express that. We've just launched the current edition online, and it covers the Scottish Learning Festival, TeachMeet07, Channel 4's In The Wild, entrepreneurship, leadership and kids getting green (with the environment, that is, not with envy). For the first time, you can actually comment on all the articles, adding where you think we've got it wrong, missed out a classic example of something, or just to add your point of view. So, do you agree with Carole Craig's view that Scots' main problem is that we don't have enough confidence in what we do well? Do you think that her view at In The Wild that social networks encourage inward, self-involved behaviour from young people? Her talking points are just some of the issues with which anyone, in Scottish education or not, can add their opinion. At the moment the team are working hard to speed up the time it takes for comments to appear. Hopefully, within a few hours/days, comments will just appear instantly, as is our wont. In the meantime, I'd also like to give a shout-out to our Kiwi magazine neighbours at Interface, for which I was interviewed last month. I outline my new responsibilities and what I think the future of new technologies in the classroom is. Far too much of the royal 'I' from me, too, here, but I hope you get something out of it.